The biosphere reserve „Flusslandschaft Elbe“ is stretching approximately 400 km along the river from the federal state Sachsen-Anhalt in the south to Schleswig-Holstein in the north. 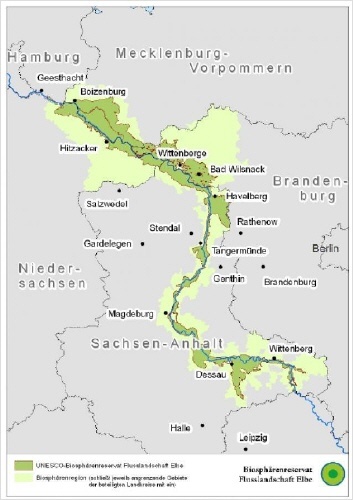 This large floodplain ecosystem extends over the borders of two national states (Germany, Czech Republic) and five Germen federal states (“Bundesländer”). In the Czech Republic only smaller areas in floodplains have been left. In the mountain areas larger reserves (e.g. national park) exists. 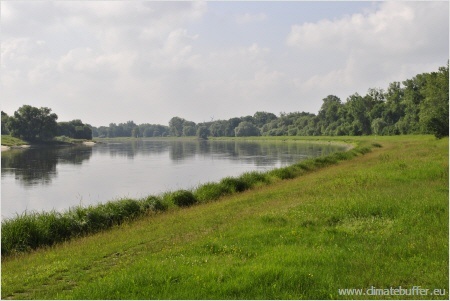 The German „Flusslandschaft Elbe“ is subdivided in five separate and independent biosphere reserves which are administered by the regional authorities. More than 25 % of the river section is protected as Natura 2000 site. Numerous floodplain meadows and riverine forests in almost natural condition are still preserved alongside the river, surrounded by cultural landscapes, which developed during centuries. The area represents one of the last near-natural river-landscapes in Central Europe. It covers an area of 342,848 hectares and is the largest biosphere reserve in the inland of Germany. It was recognized by the UNESCO at the end of 1997. During our visit we got to know one of them, the biosphere reserve "Mittllere Elbe" in Sachsen-Anhalt. The mouth of one of their tributaries belongs to the biosphere reserve too, the river “Untere Havel” which we also visited. but more or less connected. The project was funded from a Leonardo da Vinci grant.